Happy February 1st everyone! 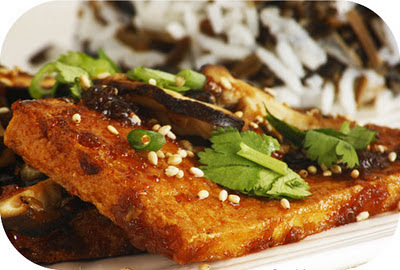 To celebrate the awesome weather that we've been having... here's a recipe for tofu steaks! Actually they are more like slabs, but slab is not a very pretty word. These are deliciously scrumptious no matter what you call them! The edges and corners of the tofu slices get all crispy and caramelized thanks to the maple syrup and super high heat. Yum, yum! Actually if you cut them into match stick-like shapes, they'll get even crispier! This recipe is super simple and easy to whip up even on a tight schedule! You could assemble the marinade ingredients the night before and bake the tofu when you get home from work the next evening. It's awesome in sandwiches, chopped up in stir fries, wraps, salads or just eat it on its own! Whisk all marinade ingredients together in a large Tupperware with a lid. Slice tofu into 10 - 12 slices and pat each piece with a paper towel or clean dish cloth to remove as much moisture as you can. Alternatively, you can slice the block of tofu into match sticks. They will marinate all the way through and will get really crispy! Like tofu fries! Either way, submerge all tofu pieces in the marinade and put the lid on the container. 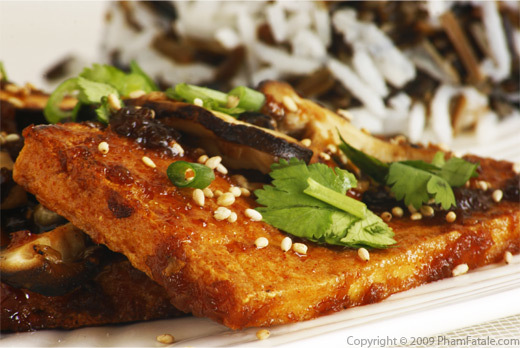 Allow tofu to marinate between 5 hours and 1 day! The longer the better! Once tofu is marinated to your satisfaction, bake in a 475-500 degree oven. Place tofu slices on a parchment paper lined baking sheet, reserving excess marinade. Bake for about 15 minutes and remove tray from oven to flip each piece of tofu. Drizzle remaining marinade over the tofu slices. Bake for another 15 minutes or until sufficiently browned and caramelized. Before serving, garnish with sesame seeds, green onions and a sprig of cilantro. Oh my, I love the idea of the sugars caramelizing into crispy deliciousness!